How Much Do I Tip for a Pedicure? The standard tip for a pedicure is around 15 to 20 percent. However, your tip depends on a variety of factors, including the quality of the pedicure, the services provided and the spa you visit. Evaluating each of these things helps you determine precisely how much to tip your nail technician. Emily Post suggests that for most spa and salon services, including pedicures, you should tip in the 15- to 20-percent range. This spectrum gives you some flexibility in adjusting your tip based on the quality of the pedicure. A mediocre pedicure might only warrant a 15-percent tip, while a technician who pampered and perfectly polished your tootsies may have earned a 20-percent tip. So, for a $35 pedicure, a tip of $5.25 to $7 is customary. Tipping over 20 percent is a thoughtful way to thank your nail technician for a job well done. Reserve these generous tips for supreme service. Consider other factors when determining how much to tip your nail tech. Salon experience. A higher-end spa may produce better service and, in turn, a more generous tip. 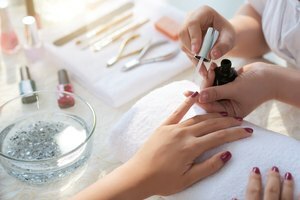 For instance, if your salon provides you with a complimentary drink during your pedicure or upgrades your pedicure to the deluxe version at no extra charge, consider tipping more than 20 percent. Number of service providers. When you calculate your tip, factor in how many nail techs worked on your pedicure. If you received a bit of pampering from more than one tech, tip each of them for their work. For example, one nail tech might have worked on trimming your cuticles and filing your toenails, while another might have massaged your legs and polished your toes. Bring cash to your pedicure so that you can easily divide the tip among your service providers. Cost of the pedicure. Perhaps you've found a skilled nail technician at a low-cost salon. If the cost of the pedicure is particularly low but the quality of the pedicure is high, you may wish to tip more than the standard amount. A 20-percent tip on a $15 pedicure might not adequately thank your nail tech for his or her hard work. Never confuse tipping with gifting. If you're a long-term client of a favorite nail tech, you might want to bring him or her a gift during the holidays. This thoughtful gesture is welcome but should not be used in place of a tip for the pedicure. If, for example, you bring your nail tech a homemade holiday gift, be sure to tip for the pedicure as well. Or, combine a year-end cash tip with your standard tip for the pedicure. After all, you don't want to look like a Scrooge. What Happens During a Pedicure?